There is no direct course to the subject matter, the message or communication. gowanus atropolis often writes around that realm of plants and animals, fungi and sealife that surround us no matter our location. Brolaski is particularly interested in the tidal, river-sected landscapes of New York. But the natural world is nothing immediately recognizable, not a traditional landscape painting or a landscape poem. There isn’t so much a sense of beauty in the natural world as much as a loss and an insistent appearance of grossness, the grotesque realities of fleshy creatures. And these creatures are constantly showing up in contaminated locales and war zones; in fact, Brolaski’s poems never stray too far from the battlefields, whether those are Superfund sites in Brooklyn or the Euphrates in Iraq or Taliban hideouts in Afghanistan. Here, there’s an obvious affinity with the ecopoetic work of Jonathan Skinner: nature is not some distant, separate entity, but rather it is everywhere in war and strife and our failing cities (“a wave of velvet revolutions / where albino fishes / swim with no eyes”). If there is any future, it is in the suffocating inhabitants of the thresholds between different spaces. The book seems to ask: what is the process for a human to become an animal and for an animal to become a human? Somehow we shall still overcome, setting off into the sun; there are rare moments in the book where a rebirth does seem possible. And yet, Sludgie isn’t the only animal losing xir ungendered way in the murky, post-industrial depths. If queers are fish, why can’t they be boring? Why can’t they be unscathed? And what is love anyway in this mess of resource extraction and the tangled mass of laws allowing exploitation and global warming? There’s something melancholy and sweet in the poem, dare-I-say twee to it. Twee is not really a word I would use to describe any of the other poems in the book. But sometimes this mixture of sweet sadness does emerge in other places; it just usually appears for an instant, for a line or a couplet or a stanza and then immediately diffuses back into the more (un)familiar, unsettled landscape of Brolaski’s work. This book is also an invitation (not an obligation) to research, to piece words apart, to run to the dictionary and encyclopedias, to struggle and to engage and to learn. The strangeness of the words open up a myriad of possibilities. Do you look up the words you don’t know? Can you invent meanings for these words? Especially with the archaic words, you’d need a subscription to the Oxford English Dictionary with all of its etymological wonders to really begin to crack open the etymologies herein. Brolaski’s work invites the reader to be a sleuth. At the same time, I’d argue this apparent move towards the past is something else entirely; the move towards Karl Marx’s root (i.e. the radical) drives us towards a renewed present. In Meddle English, Caroline Bergvall writes that contemporary writers use historic language detail “as a rich field of lived and deductive approximations, some based on ground research, some on the mysterious pleasure grain of the vocalizing, materializing text. 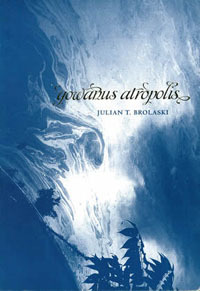 A way of surfing the uneven, unruly canopy of present conditions without assimilating them to a dive in the past.” Brolaski’s poems definitely embody this mysterious pleasure and also resist any attempt to define this work as somehow mining the past. These poems are clearly subjects of the present. Titivil, titivillus, tutivillus: what shockingly delectable words. And what a concept, this devil who collects fragments of words deployed badly (mumbled or jumbled) in a holy service and collects them to use against the sinner in hell. In my reading, the tutivillus becomes another totem of the book: a queer patron saint for experimental writers. We can see Brolaski as another tutivillus eagerly gathering up all the words “dropped, skipped or mumbled” in the “divine service” of daily life or the “divine service” of poetry. What words have been relegated to an irretrievable past? Why are some words marked as historical? How can we circulate all these seemingly strange, queer, lost words and ground them in their present milieu? Is this the book of all the lost words we find in hell in the tutivillus’s lair? All the words long since removed from daily usage or words which long to be used more often? If this is so, who is Brolaski using these words to condemn? Who is going to hell? John Pluecker is a writer, interpreter, translator and teacher. His work has been published by journals and magazines in the U.S. and Mexico, including the Rio Grande Review, Picnic, Third Text, Animal Shelter and Literal. He has published more than five books in translation from the Spanish, including essays by a leading Mexican feminist, short stories from Ciudad Juárez and a police detective novel. There are two chapbooks of his work, Routes into Texas (DIY, 2010) and Undone(Dusie Kollektiv, 2011).